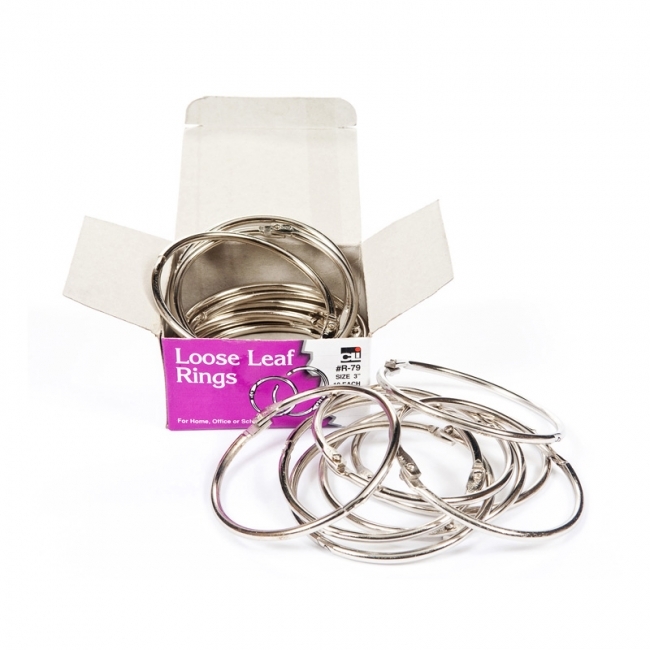 Versatile rings feature precision snap lock closures. Ideal for samples, swatches, looseleaf material and more. Bright nickel-plated rings are rust-proof. Rings measure 1" diameter. Each box includes 100 rings. 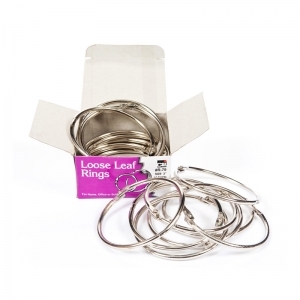 Versatile rings feature precision snap lock closures. Ideal for samples, swatches, looseleaf material and more. Bright nickel-plated rings are rust-proof. Rings measure 1.5" diameter. Each box includes 100 rings. Book rings are the sure fast method of keeping things together. 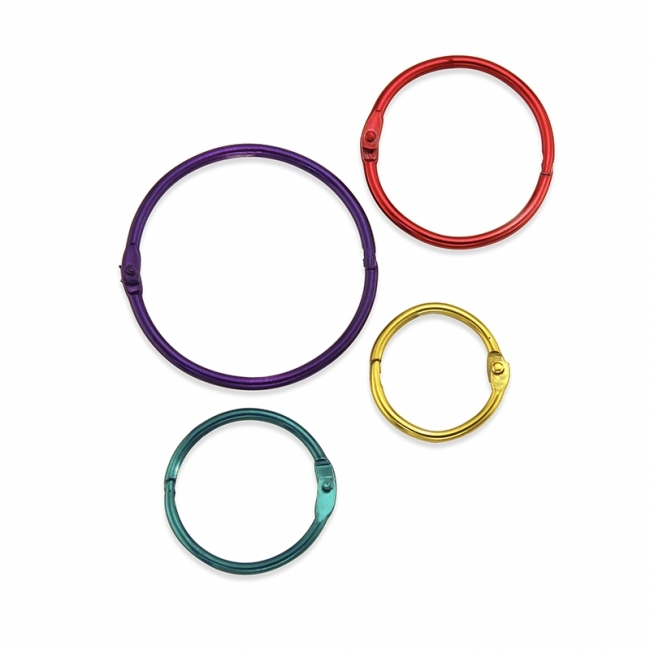 These binding rings are made with smooth and tough steel coating that ensures that your binder rings won't crack or chip. Durable metal book rings can be used for a huge assortment of projects as well as conveniences around the home and classroom. 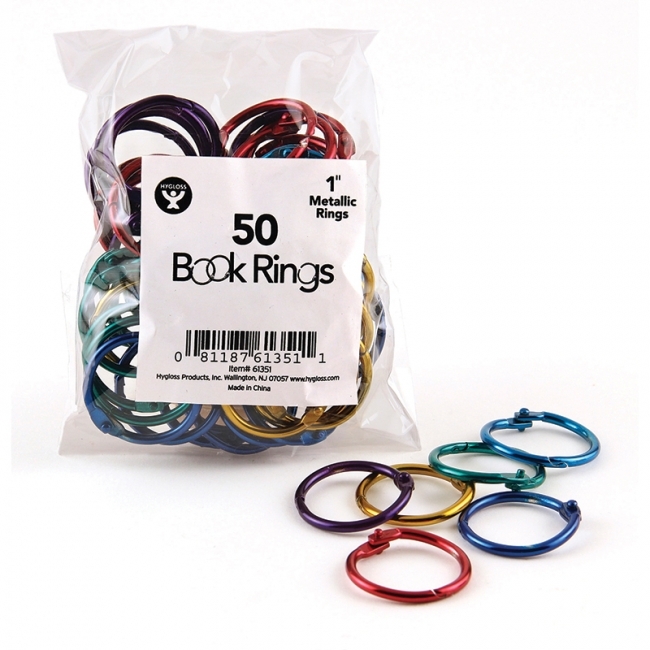 That's right, book rings are not just good supplies for the office anymore. Make fun and user-friendly projects such as calendars, fabric swatch holders, mini scrapbooks, key rings and recipe books using these nifty binder rings. Binding rings are just the right things for creating your very own motion and flip books, and rings that bind are perfect for projects such as baby books or scrapbooks because they offer the flexibility and room for adding more pages in the future. Use your sturdy binding rings to hang up signs and notices or even to keep important papers, game pieces or scraps together. The easy to open clasp mechanism is equally simple to close, and, yet, locks securely and holds strong every time. A rust free metal book ring from Hygloss is meant to last through heavy duty usage and can stand up to wear and tear. Book rings are the sure fast method of keeping things together. 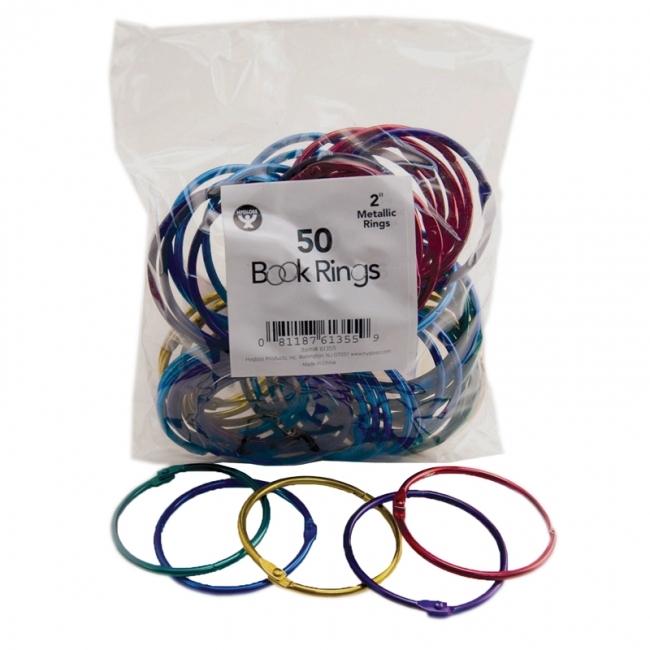 These binding rings are made with smooth and tough steel coating that ensures that your binder rings won't crack or chip. Durable metal book rings can be used for a huge assortment of projects as well as conveniences around the home and classroom. 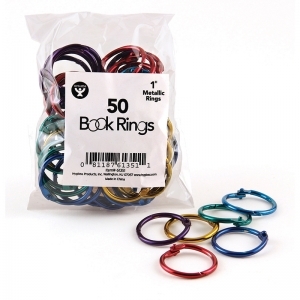 That's right, book rings are not just good supplies for the office anymore. 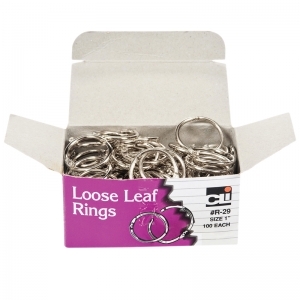 Make fun and user-friendly projects such as calendars, fabric swatch holders, mini scrapbooks, key rings and recipe books using these nifty binder rings. Binding rings are just the right things for creating your very own motion and flip books, and rings that bind are perfect for projects such as baby books or scrapbooks because they offer the flexibility and room for adding more pages in the future. Use your sturdy binding rings to hang up signs and notices or even to keep important papers, game pieces or scraps together. The easy to open clasp mechanism is equally simple to close, and, yet, locks securely and holds strong every time. A rust free metal book ring from Hygloss is meant to last through heavy duty usage and can stand up to wear and tear. 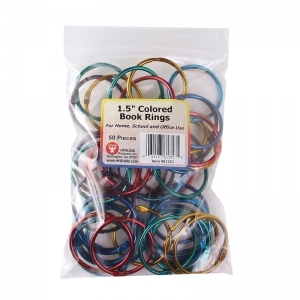 This pack of rings are 1" and come in unique matallic colors, 50 per pack. Book rings are the sure fast method of keeping things together. 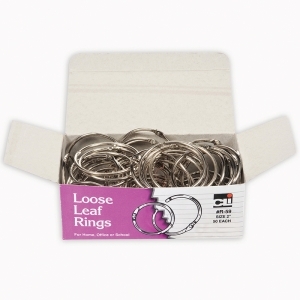 These binding rings are made with smooth and tough steel coating that ensures that your binder rings won't crack or chip. 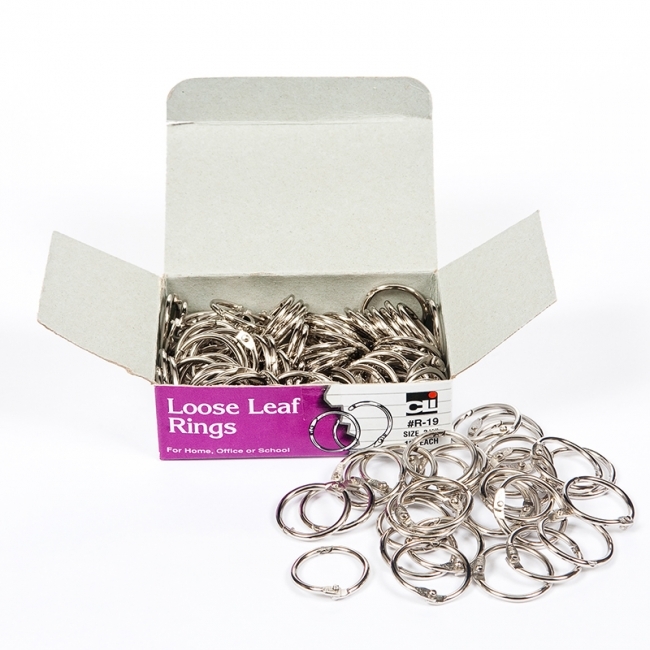 Durable metal book rings can be used for a huge assortment of projects as well as conveniences around the home and classroom. That's right, book rings are not just good supplies for the office anymore. Make fun and user-friendly projects such as calendars, fabric swatch holders, mini scrapbooks, key rings and recipe books using these nifty binder rings. Binding rings are just the right things for creating your very own motion and flip books, and rings that bind are perfect for projects such as baby books or scrapbooks because they offer the flexibility and room for adding more pages in the future. Use your sturdy binding rings to hang up signs and notices or even to keep important papers, game pieces or scraps together. The easy to open clasp mechanism is equally simple to close, and, yet, locks securely and holds strong every time. 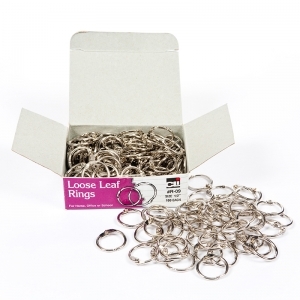 A rust free metal book ring from Hygloss is meant to last through heavy duty usage and can stand up to wear and tear. Rings measure 1.5" and come in unique metallic colors, 50 per pack. Book rings are the sure fast method of keeping things together. These binding rings are made with smooth and tough steel coating that ensures that your binder rings won't crack or chip. Durable metal book rings can be used for a huge assortment of projects as well as conveniences around the home and classroom. That's right, book rings are not just good supplies for the office anymore. Make fun and user-friendly projects such as calendars, fabric swatch holders, mini scrapbooks, key rings and recipe books using these nifty binder rings. Binding rings are just the right things for creating your very own motion and flip books, and rings that bind are perfect for projects such as baby books or scrapbooks because they offer the flexibility and room for adding more pages in the future. Use your sturdy binding rings to hang up signs and notices or even to keep important papers, game pieces or scraps together. The easy to open clasp mechanism is equally simple to close, and, yet, locks securely and holds strong every time. A rust free metal book ring from Hygloss is meant to last through heavy duty usage and can stand up to wear and tear. 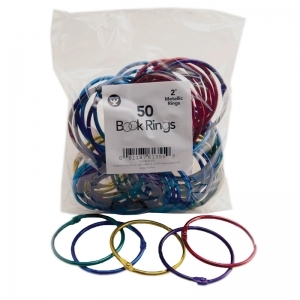 This pack of rings are 2" and come in unique matallic colors, 50 per pack.